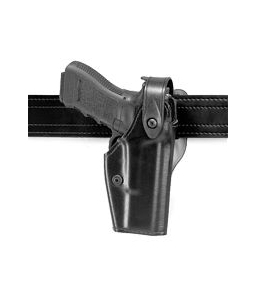 Safariland Mid-Ride, SLS Level 2 Retention Holster | 700381, SAFARILAND, Safariland Mid-Ride, SLS Level 2 Retention Holster | McDonald Uniforms, Inc.
Safariland Self Locking System Holster with revolutionary rotating thumb break. Provides reliability under any situation & a quick draw when you need it. It features our patented rotating hood & tensioning device for increased weapon retention.Rotate the hood forward & you can draw your weapon instantly. Pull it back & it secures your weapon in the holster. 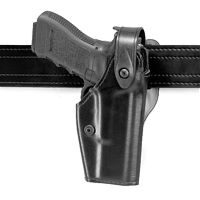 The Duty version of our SLS system holster offers you a high degree of safety & performance. Mid-ride, Level II Retention It's easy to spot a Safariland SLS System holster. With its Self-Locking-System (SLS) and rotating hood, this holster provides smooth, single motion draw and greater protection against attempted weapon takeaways. LAPD and LASD approved.